Despite the state enacting anti-union “right-to-work” legislation in 2016, support for the teachers among the public remains strong in the once union stronghold of West Virginia. On the picket line outside of Bridge Street Elementary, cars drove by honking and yelling in support of the striking teachers. Horns blared as Sub Express shop owner Perry Wade stopped his car to get out and thank the teachers. “It’s not much, but it’s more than they are giving you in Charleston,” joked Wade as he hands them cards for free six-inch subs. To read the full story go to the Guardian. 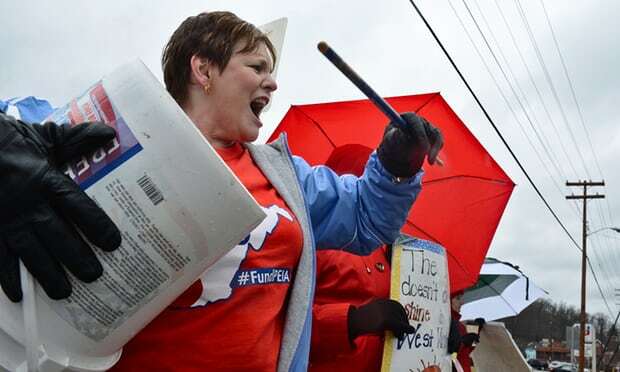 Be the first to comment on "From the West Virginia Teachers’ Picket Line in Wheeling"